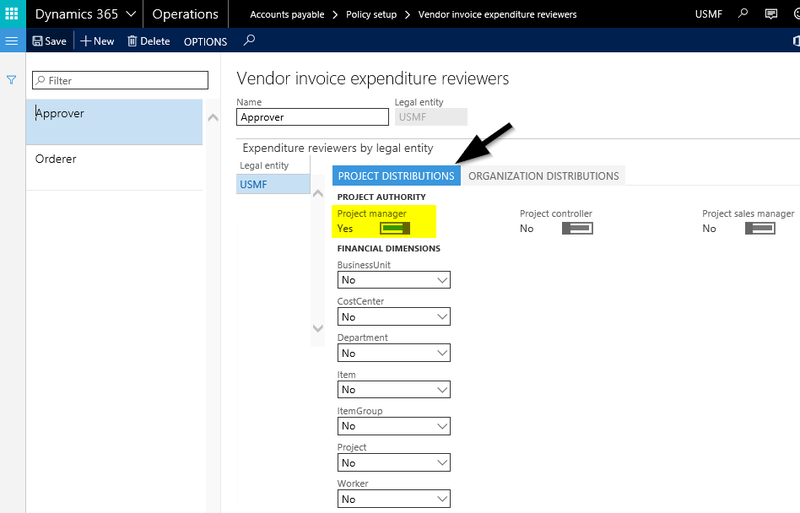 In the previous posts, the responsible for approving the vendor invoice was identified by the approver expenditure reviewer group, which was specified in the approval workflow step. For details, please see the next screen-print. While the previously used setup allows the identification of a single invoice approver, it does not help much in companies that make use of hierarchical signing limits. How hierarchical signing limits can be incorporated into the invoice workflow will consequently be investigated in this post. The next screen prints show the changes that have been made to the workflow setup in order to get the hierarchical signing limits incorporated. 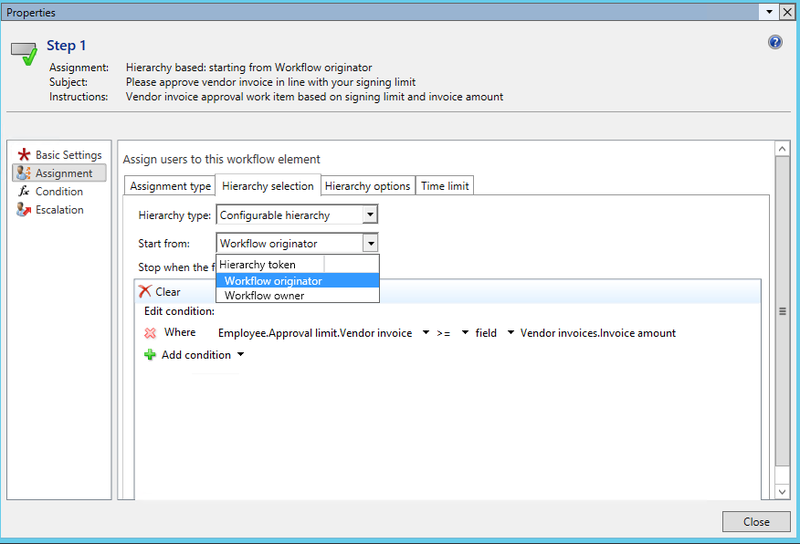 For that purpose, the second workflow step (singing limit based approval) has been changed and does no longer refer to the assignment type participant but rather to the assignment type hierarchy, as exemplified in the next illustration. 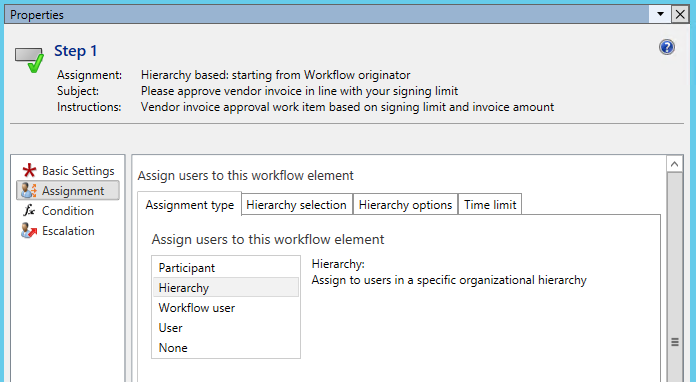 A major issue in regards to the selection of a hierarchical assignment is that the hierarchy can either start from the workflow owner – which refers to a ‘static’ user– or to the workflow originator. Provided that an accountant – who is not included in the managerial hierarchy of the persons involved in the review and approval process – initiates the workflow, i.e. 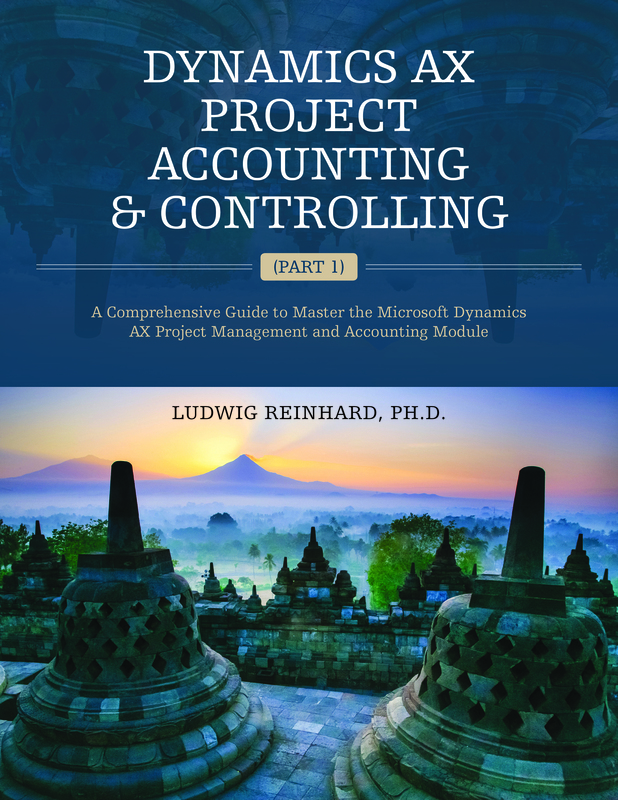 acts as workflow originator, the line manager of the accountant and not the manager of the orderer would get the approval workflow step assigned. 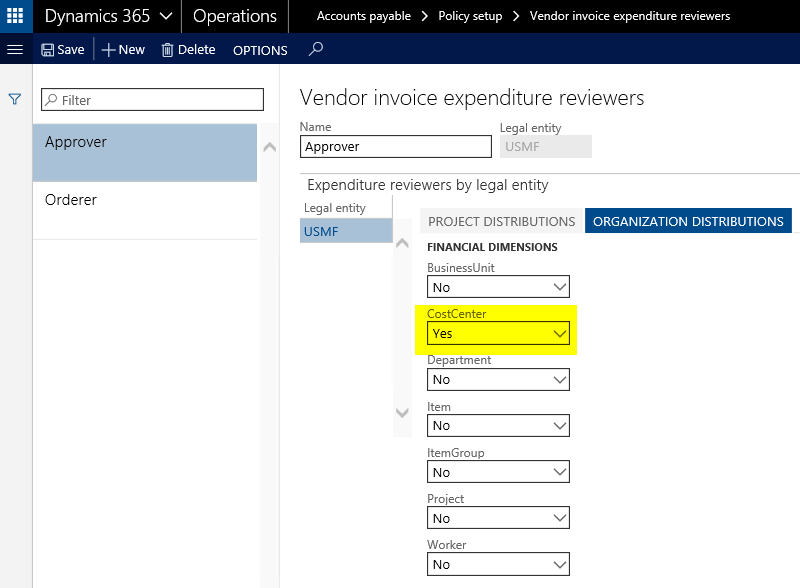 To avoid such wrong assignments, a new position hierarchy (LRE signing) is setup, which starts with the accountant (Phyllis Harris) that records the invoice in Dynamics AX/365 for Operations. The following hierarchical levels are determined by the operative management (Benjamin Martin), the executives (Julia Funderburk) and finally the president of the unit (Charlie Carson). For details, please see the next screen print. This position hierarchy needs then to be associated with the workflow through the associate hierarchy button shown in the next illustration. Once this is done, the condition for identifying the correct person to approve the invoice can be specified. The next setup required consists of specifying the signing rules for the different positions respectively levels. The rules used for the following examples are shown in the next figure. With the modified workflow and the signing limits in place, an invoice for a total of $47500 is recorded in the pending vendor invoice form by Phyllis, the accountant. To clearly differentiate the workflow from what has been shown in the previous posts, only the orderer (Nicole Holiday) is entered in the financial dimension worker field. A cost center has, however, not been specified. 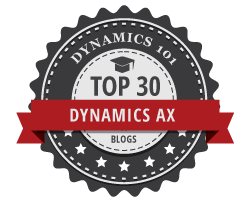 Irrespective of whether and which cost center is entered, Dynamics AX/365 for Operations finds the correct approver by successively working through the signing limits that have been setup. The next screen print shows the users that are addressed by the workflow for the $47500 invoice. 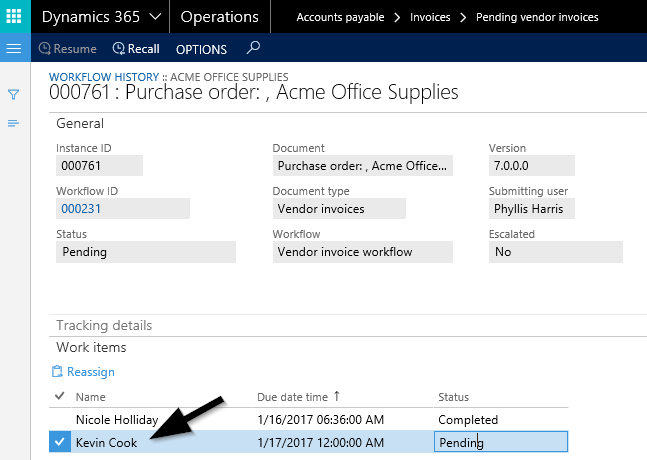 As one can identify from the previous illustration, Nicole Holiday is the first user addressed by the workflow in order to review the vendor invoice. Thereafter, Benjamin Martin, Julia Funderburk and Charlie Carson need to approve the invoice before it can be posted. Even though Benjamin Martin and Julia Funderburk do not have a sufficiently large signing limit, they still need to approve the invoice because of the workflow setup. The successive assignment of the invoice approval can be cut short by defining that only the last user retrieved, that is the one with a sufficiently high signing limit, shall get the task assigned. The next screenshot exemplifies this. This slight modification in the workflow setup results in a situation where Benjamin Martin and Julia Funderburk are skipped from the approval task for the $47500 invoice, which is directly assigned to the person with the appropriate signing limit (Charlie Carson). 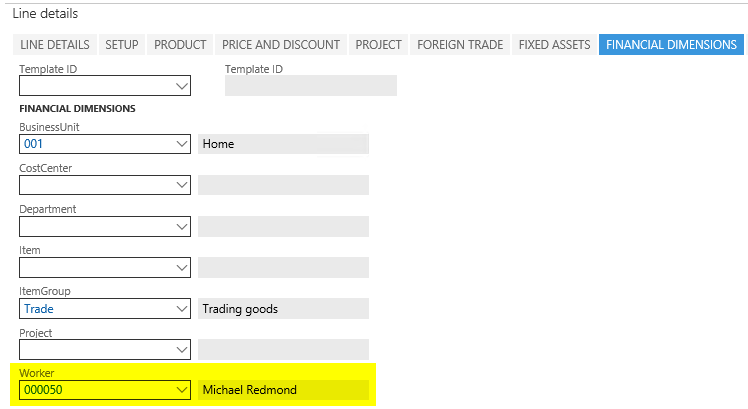 Now let’s modify the example in a way that the materials are ordered by Michael Redmond and need to be approved by his line manger (Kevin Cook). For that reason, another vendor invoice, this time for $2000 is entered in the vendor invoice workbench. Different from what has been shown before, this time, Michael Redmond – the orderer – is entered in the worker financial dimension field. After Michael Redmond reviewed the invoice, the invoice approval is assigned to Benjamin Martin and not Kevin Cook, which can be identified from the next screen print. The underlying reason for this outcome is the position hierarchy that has been assigned to the workflow and which does not include Kevin Cook. For details, see further above. At this point, one might think to simply add Kevin Cook in the signing position hierarchy. The major problem with this approach is that Dynamics AX/365 for Operations currently only allows a single relationship between the different positions included in the hierarchy. 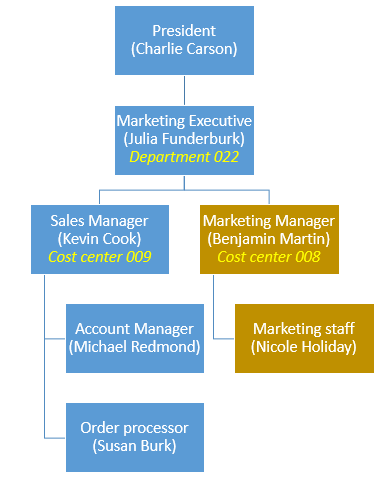 In other words, position hierarchies that include more than a single branch, such as for Kevin Cook (the sales manager) and Benjamin Martin, (the marketing manager) that both report to Julia Funderburk, (the marketing executive), require some additional setups, which will be explained in the next post. 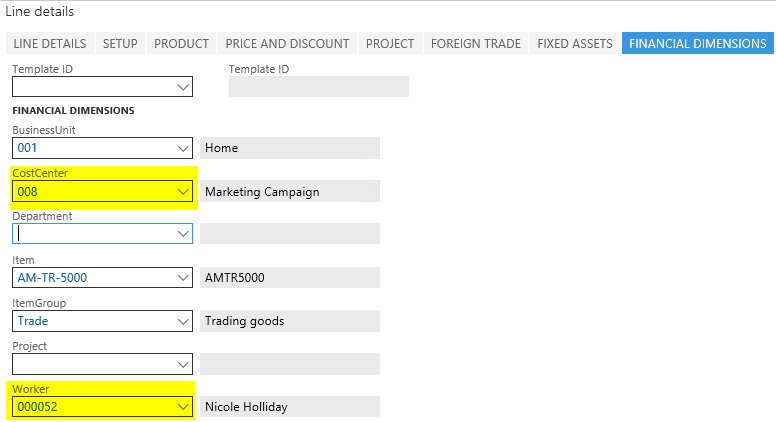 Within this second part of the series on vendor invoice recording, we start with a process where a marketing employee (Nicole Holiday) orders some marketing materials via Email. After the materials have been received by Nicole Holiday, the vendor invoice arrives and is manually entered in the pending vendor invoice form. After recording all invoice related data, the AP clerk initiates the invoice workflow. Within the first workflow step, the one who ordered the materials (Nicole Holiday) needs to review the invoice and confirm that all ordered materials arrived in good condition. Thereafter, the cost center manager (Benjamin Martin) needs to approve the expense amount before it can be posted and paid later on. 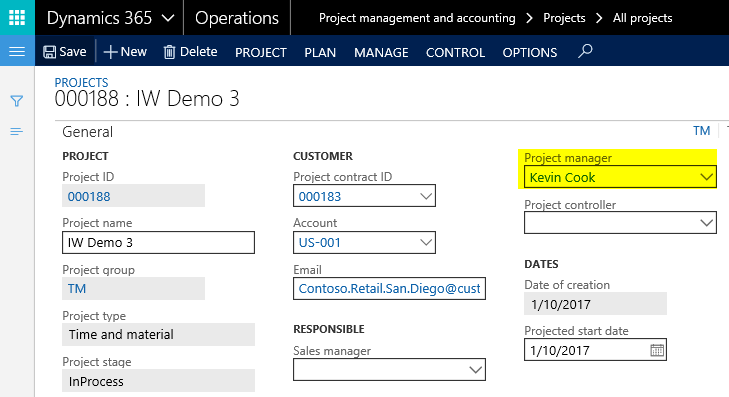 The next flowchart summarizes the different process steps that will be investigated in more detail from a Dynamics AX/365 for Operations perspective. 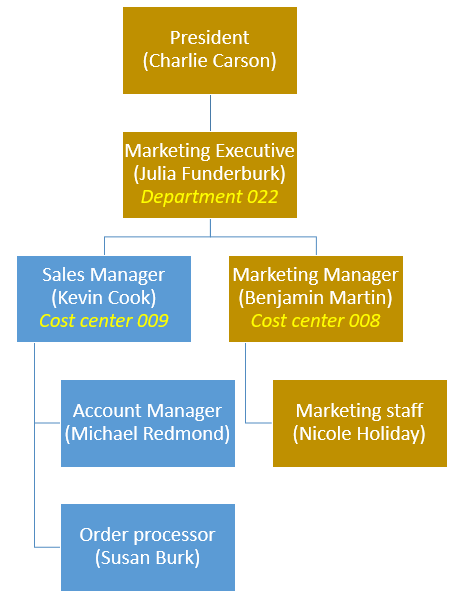 The following organizational chart highlights the employees/positions involved in the process in light brown color. Note that this chart will also be used for the subsequent posts on vendor invoice recording. 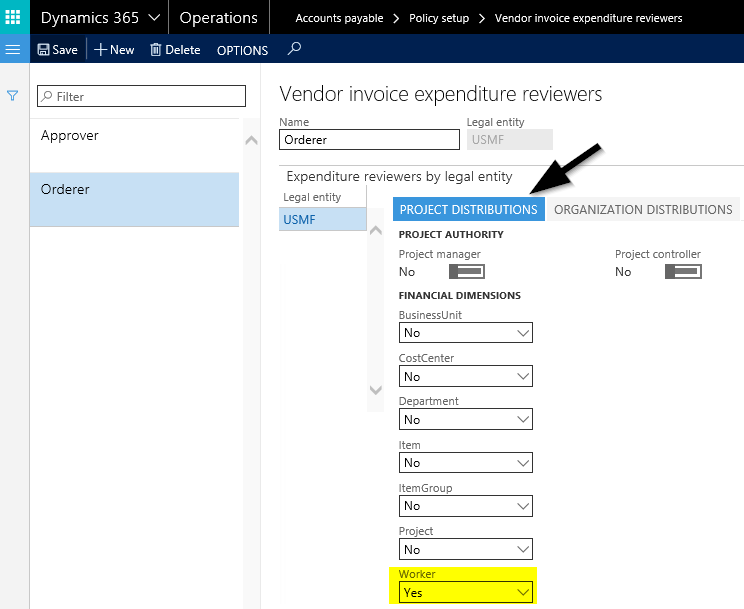 Based on findings that have been made by other Dynamics AX/365 for Operations experts – please see the following post / video – the invoice approval workflow has been set up in a way that makes use of two different expenditure reviewer groups. The first expenditure reviewer group – denominated as orderer – thereby makes reference to the financial dimension worker and automatically assigns the workflow work-item task to the worker specified in the financial dimension worker field. For details, please see the following setup. Getting the invoices correctly assigned to the person who ordered it, requires setting up all employees with their own financial dimension. In addition, each employee must be specified as the owner of this financial dimension because the financial dimension owner defines the person who has to review the vendor invoice. The next screen print shows this setup for Nicole Holiday who ordered the marketing materials. The second expenditure reviewer group – denominated as approver – references the cost center financial dimension. The person responsible for approving the invoice is consequently the one that is setup as the owner of the respective cost center. In the example illustrated, this is Benjamin Martin as the head of cost center 008. It is the financial dimension owner and not the manager of the corresponding operating unit that is referenced through the expenditure reviewer group. The way how the setup is made requires that the expense invoice is entered with the financial dimension worker, which defines the orderer who is responsible for verifying that the ordered materials arrived. In addition, the respective cost center needs to be entered because it determines the manager that is responsible for approving the invoice. After describing the elements required for the invoice workflow, let’s have a look at the different workflow steps and the overall setup of the sample workflow used in this post, which is illustrated below. 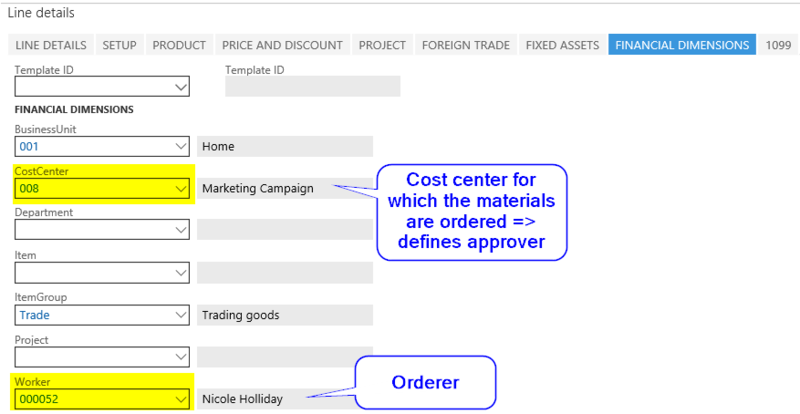 The following two screen prints show the setup of the first workflow step (review invoice) that requires Nicole Holiday reviewing whether all materials have been delivered by the vendor. 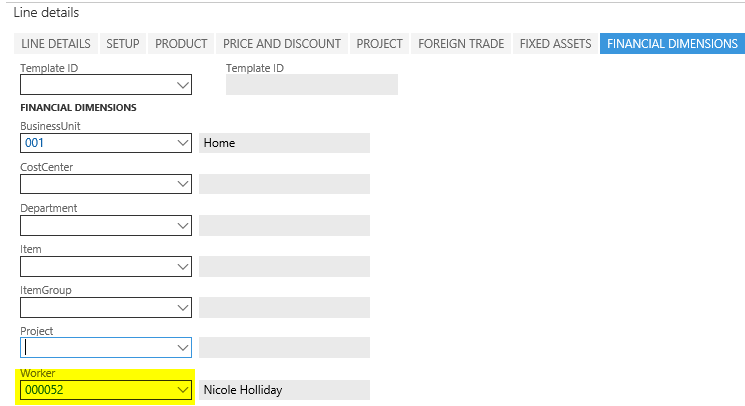 Please note that Nicole holiday is not directly addressed in the first workflow step but rather the workflow participant ‘orderer’. As the expenditure reviewer group ‘orderer’ links to the financial dimension ‘worker’, the person who ordered the materials needs consequently be entered in the financial dimension worker field at the time the invoice is entered. This will be shown further below. 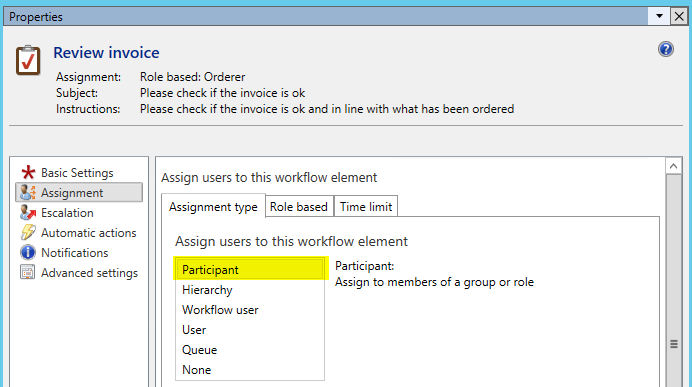 The second workflow step – the invoice approval step – is also assigned to a workflow participant. This time, the approver, as illustrated in the next screen prints. With this setup in place, let’s record the expense invoice for the marketing materials. 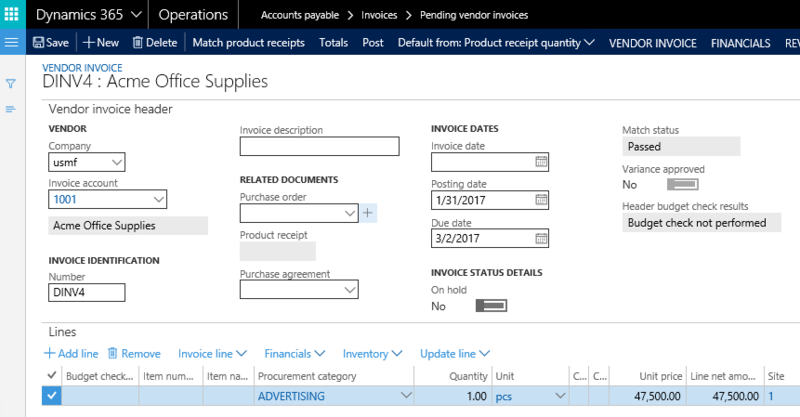 The next illustration shows the vendor invoice recording, which makes use of the ‘advertising’ procurement category that defines the ledger account that will be used for posting the invoice. Please note that the orderer (Nicole Holiday) is entered in the financial dimension worker field. The person that needs to approve the invoice is determined by the owner of the cost center entered in the cost center financial dimension. After all invoice details are entered, the workflow process is started by the accountant Phyllis Harris. 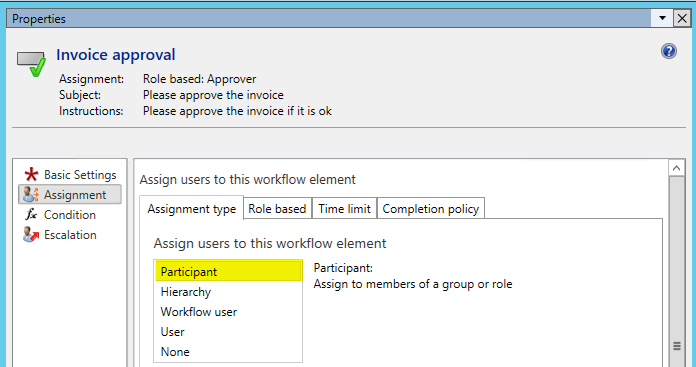 Based on the workflow setup, Nicole Holiday is the first one that gets a workflow item-task assigned. Please see the next screen print. If Nicole opens the assigned work item, she can inspect the invoice recorded by the AP clerk. Provided that everything is ok, she can then complete her review task. If Nicole Holiday rejects the review, the invoice will be returned to the AP clerk who can then clarify with the vendor how to deal with the invoice received. Provided that the invoice is unjustified, the AP clerk has the option to recall the workflow and delete the record from the pending vendor invoice form until a new or corrected invoice from the vendor arrives. Another available workflow action for Nicole is to delegate the workflow task to another user who will then become responsible for finalizing the invoice review workflow step. Once Nicole has completed her review task, the workflow assigns another work-item to Benjamin who has to approve the amount to be spend. Benjamin can similarly choose among different workflow actions, such as approve, reject, etc. In addition to approving the invoice Benjamin Martin has the option to reject the invoice, which returns it to the AP clerk – the workflow originator – who can then decide how to proceed. Delegating the approval step assigns the invoice approval to another user. The same applies to the request change workflow action, which allows specifying a user that has to make some changes – for example to the sales tax – before the invoice workflow can continue. … and the invoice becomes available for posting. Provided that all invoice details have already been entered in the first place and against the background that the invoice has been reviewed and approved by two different people, it can be posted automatically from the author’s perspective, which can be realized by including an automatic posting step in the workflow. The next screen print illustrates this. 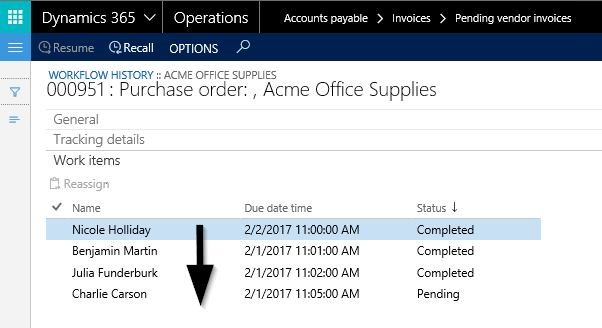 Posting the vendor invoice ends this second post on vendor invoice recording. The next posts will successively extend the sample invoice workflow process illustrated here. Till then. Over the last couple of years, I have seen a lot of different ways how companies record and process their vendor invoices. Some people I talked to about vendor invoice processing mentioned that the standard invoice recording tools would not be sufficient, others stated that they are too complex and even one time I was confronted with the statement that the standard tools cannot be used because ‘everybody’ says that they are not mature enough. Many of those people resp. companies ended up implementing expensive software add-on’s that often had their own problems and required some customizations in the form of interfaces and alike. 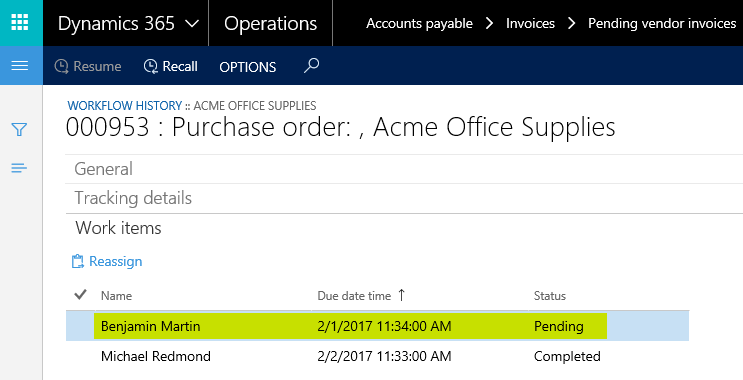 Against the background of those statements, I will illustrate within this and the following posts how expense and purchase order related vendor invoices can be processed in the standard Dynamics AX/365 for Operations application. Expense related vendor invoices are those for which no purchase order has been created and that are consequently not matched against product receipts. 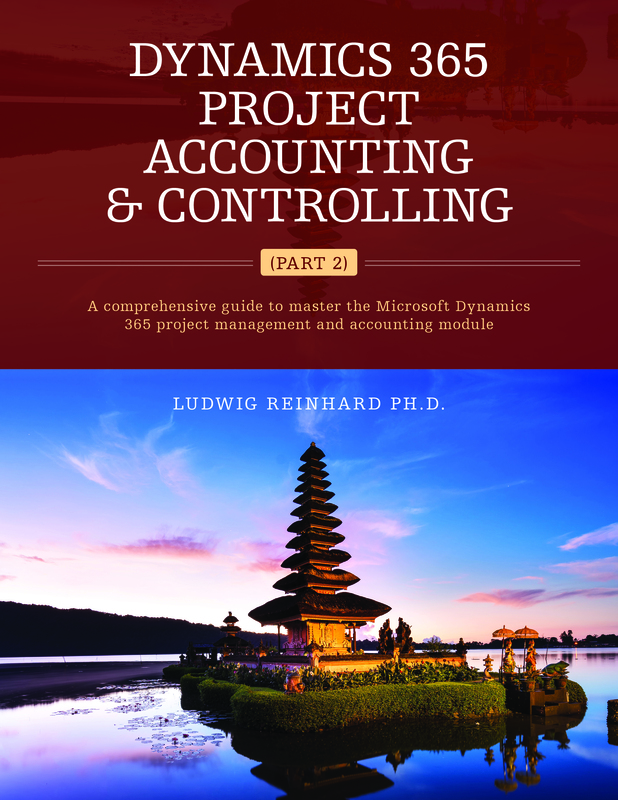 The aim of this series is not to backfire on those previous – sometimes quite offensive – statements I was confronted with but rather to carve out the advantages and disadvantages, strength and weaknesses of the standard invoice recording tools in order to allow you making your own assessment. 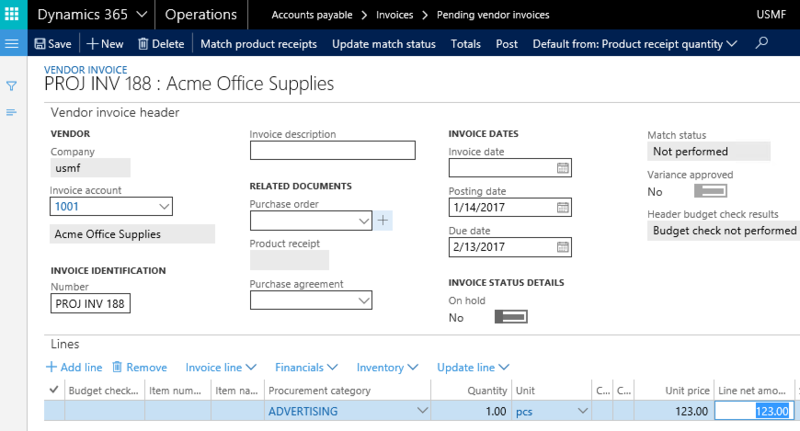 The invoice workbench provides a single point of entry for entering expense related and purchase order related invoices. Project related expense invoices that are recorded through journals are not considered as committed project cost. As a result, project costs might be observed too late, resulting in wrong decision makings and project analysis. For details, please have a look at the following post. 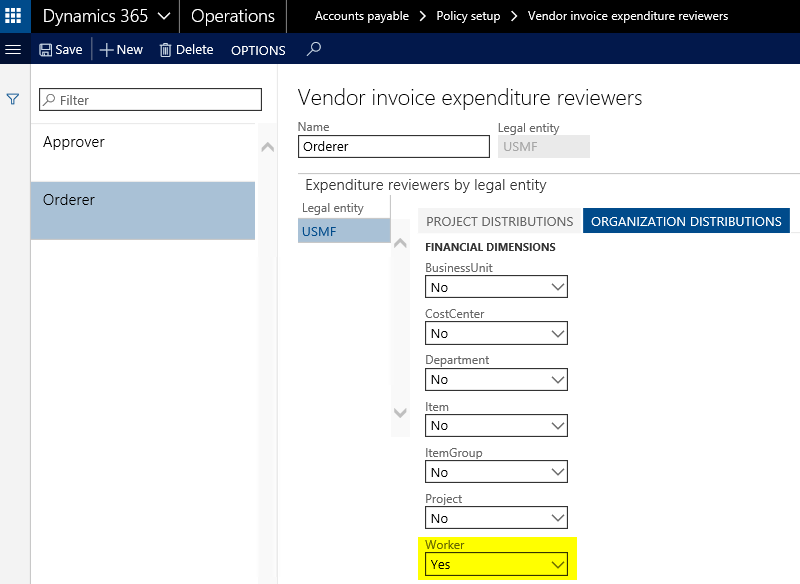 The vendor invoice workbench allows recording project related intercompany expenses that cannot be recorded through the different invoice journals. 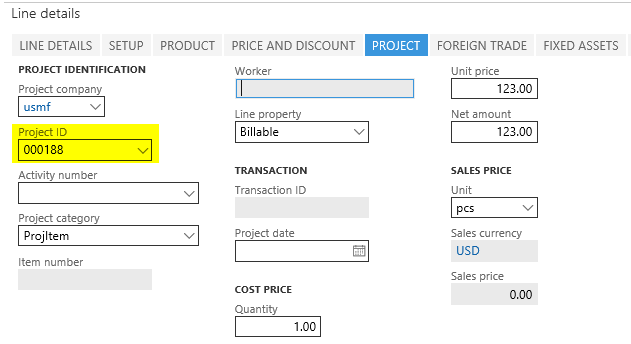 What is more, intercompany projects automatically create intercompany invoices in the vendor invoice workbench. Using journals for recording vendor invoices consequently result in a situation where companies have to differentiate between (a) ordinary expense related invoices, (b) purchase order related invoices and (c) project related intercompany invoices and record them in different forms in Dynamics AX/365 for Operations. That fact the value added tax included in the invoice amount will be posted later compared to posting it at the time the invoice is registered in the invoice register journal. This timing difference can result in cash flow related opportunity costs if the tax is deduced in future financial periods. Even though this statement is true, I have not seen many companies posting the value added tax at the time vendor invoices are registered. In addition, if the vendor invoice throughput time is short, the time difference argument falls short. That accountants who are used to recording expenses directly on ledger accounts have to relearn how they record vendor invoices. That is because the vendor invoice workbench does not allow entering ledger accounts directly but rather makes use of so-called procurement categories. The following figure illustrates an expense invoice for advertising expenses, where the ledger account that is assigned to the procurement category can be observed only indirectly through the accounting distribution form. I made the experience that this last point is often the biggest hurdle that prevents people from using the vendor invoice workbench. From the authors perspective this second point is regularly used only as an excuse that is brought forward in order to prevent changes to familiar business processes. As an example, the argument that procurement categories do not provide users with an indication of the ledger account that will be used for posting can be overcome by including or adding the account number in the procurement category name. 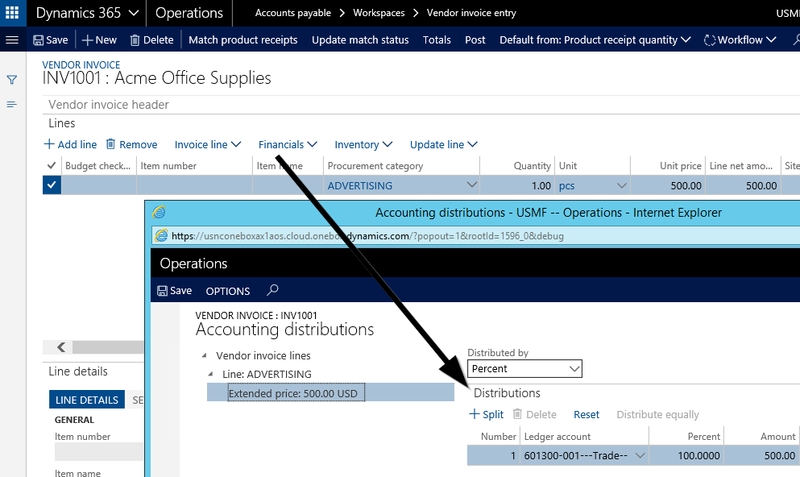 The next posts will focus on expense related vendor invoices and how they can be entered and processed through the invoice workbench in Dynamics AX/365 for Operations. Thereafter, entering and processing purchase order related invoices will be illustrated before this series will conclude with a summary of the advantages/disadvantages, strength and weaknesses of the standard vendor invoice processing functionalities.